With so much importance placed on mobile devices these days, PCs are starting to borrow features from their smaller-screened companions. One such feature in Windows 10 is built-in location services. True, your laptop or desktop doesn't have GPS capability, and many (but not all) lack the ability to communicate with wireless cell towers. Nevertheless, Windows 10 can figure out where you are using Wi-Fi positioning, as well as your device's Internet Protocol (IP) address. The results are pretty accurate. 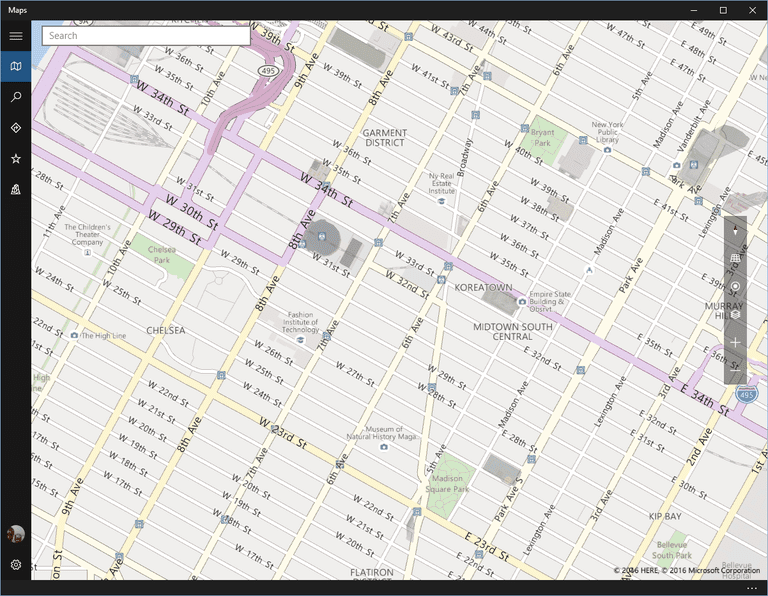 If you want to test how well Windows 10 knows where you are, open the built-in Maps app. It should show a location marker (a small solid circle inside a bigger circle) on the map where it thinks you're located. If the map doesn't fly to your location, click the location marker on the map's right-hand control panel to try again. Now, when we say Windows 10 "knows" your location, we don't really mean that someone is becoming aware of your present surroundings in real time. It just means that your PC is storing your current location in a database and will share it with apps that request it—as long as the app is authorized to have it. Windows 10 deletes your location history after 24 hours, but it still may live on in the cloud, stored by other apps and services. Location information offers a lot of benefits. It lets you quickly find where you are on a Maps app, a Weather app can deliver local forecasts based on your location, while apps like Uber can use it to send a ride to your location. Even though location can come in handy it's not an absolute necessity for all users, and Microsoft gives you enough control to turn it off. If you do decide to go location-less, however, keep in mind that you won't be able to use Cortana, which requires your location history to function. The built-in Maps app, meanwhile, doesn't require your location, but without it, Maps can't show your current location to within a few feet. To take a look at your location settings, click Start and then open the Settings app to Privacy > Location. There are two basic location controls: one for all users with accounts on your PC and one specifically for your user account. The setting for all users on your PC is right at the top where you see a gray button called Change. It probably says Location for this device is on, which means every user can use location services on this PC. Click Change and a little panel pops-up with a slider you can move to off. Doing that stops every user account on the computer from using location services. The next button below the Change button is just a slider. This is a per-user setting to turn location services on or off. Using the per-user option is a good idea if one person in your house wants to use location services while others don't. In addition to covering just your basic on/off settings for location, Windows 10 also lets you set location permissions on a per history basis. Scroll down the screen for Settings > Privacy > Location until you see the sub-heading called Choose apps that can use your location. Here, you'll see sliders with on/off options for every app that uses location. If you want to permit Maps to use your location, but don't really see the point of allowing it for Twitter, you can do that. Below the list of apps, you'll also see a little paragraph about geofencing. This is a feature that allows an app to monitor your location and then react when you leave a pre-defined area. Cortana, for example, can deliver a reminder such as buying bread when you leave work. There are no geofencing settings: it's part and parcel of the regular location settings. All this area does is let you know if any of your apps are using geofencing. If an app is using the feature this section says, "One or more of your apps are currently using geofencing." There are two last items to be aware. The first is still in Settings > Privacy > Location. Scroll up a bit from the list of apps and you'll see a section for location history. Here you can erase your location history manually by clicking Clear. If you don't use this setting, your device will erase its location history after 24 hours. The last issue to know about is that Windows 10 will alert you every time an app is using your location. It won't show up as a notification that distracts you. Instead, you'll see the location marker appear on the far right of your taskbar. When that happens an app has used, or recently used, your location. That's about all there is to location on Windows 10.